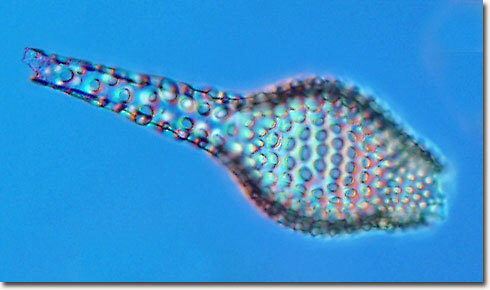 The radiolarian skeleton (test) presented above was captured utilizing an Olympus BX60 optical microscope operating in differential interference contrast (DIC) mode with a 20x plan fluorite objective. Successive optical serial sections of the specimen were recorded on a Nikon DXM 1200 camera system attached to the microscope, and merged together with an image-editing software package (Adobe Photoshop). By adding optical sections and removing out-of-focus blur, a more detailed image of the skeleton can be obtained.